Whenever I roll my bicycle backwards, even for a few feet, when I proceed forward, the chain jumps gears or wants to (it may end up back on the one it started on). This isn't normal, is it? What's the cause? I had a multi speed that used to do this. Trying to remember what I did to fix the problem. If memory serves me I "think" it was a bent derailleur hanger. Does it feel like something is sticking? Ugh please wait until someone else posts to this. Gears and chain are new. 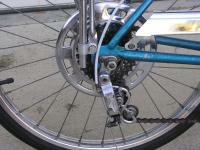 Derailleur shifts crisply and correctly in both directions. That leaves bent derailleur. I've seen info on hangers being bent. This bike doesn't have a hanger. Can the derailleur itself be bent? Is there something I can do/fix? Or does it have to be taken to a shop? Sometimes, if the chain is out of line and rolling the bike backwards, it will try to move from one sprocket to another. So when starting to pedal forwards it will then be guided back by the dérailleur to the required sprocket. I've even had the chain drop off the chainset when pedaling backwards with the bike stationary, due to an acute angle between chainset and rear sprockets. Normally when pedaling forwards the dérailleur keeps the chain on the selected sprocket but when pedaling or rolling backwards there is nothing to steady the chain between chainset and cassette. Try it with other peoples bikes if you can and see if theirs does it as well? You might look to see if you have a stiff link which won't help?